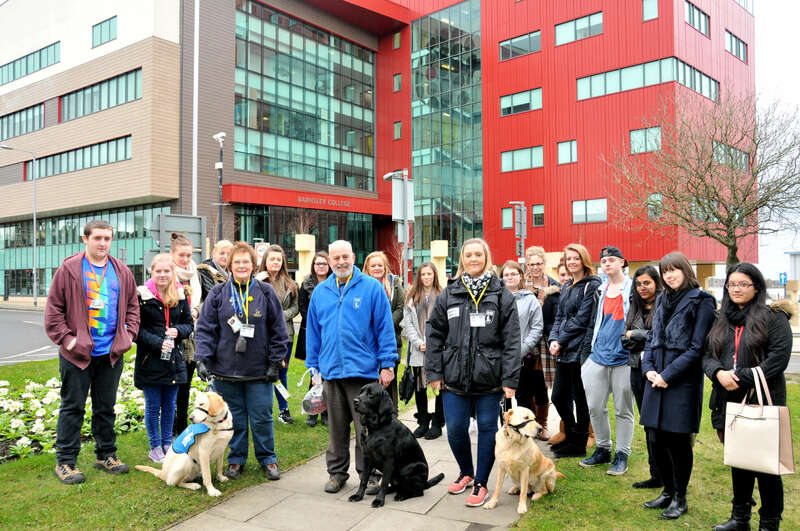 Barnsley College students have embarked on a sponsored charity walk to raise funds for The Guide Dogs for the Blind Association (Guide Dogs). The learners, who are studying Childcare and Education Professions courses, made the 2.5 mile journey to the college’s Wigfield Farm site. The walk was organised as part of the department’s close relationship with Guide Dogs. The charity has delivered tutorials to the learners about its work and how the public can support them and the department also held a sponsored ‘wear neon’ day to raise funds for the charity. Nichola Bonsall, Community Fundraiser at Guide Dogs, added: “Guide Dogs would like to thank Barnsley College for their support. The students have been taking part in various activities including the sponsored walk which I was privileged to be asked to take part in along with one of our puppy walkers Hazel Eyre, her puppy Sassy and one of our boarders Tony Kay. The students are also currently fundraising towards our Name a Puppy @ School scheme where they aim to raise a total of £1,500 to name a guide dog puppy which they will get a chance to meet. To find out more about studying a Childcare and Education Professions course at Barnsley College, contact our Information Team on 01226 216 123 or info@barnsley.ac.uk.